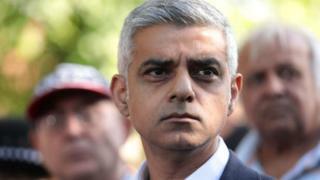 The mayor of London is renewing his appeal for schools to use knife wands following four fatal stabbings in the city in 24 hours over New Year. Sadiq Khan is offering the metal detectors to all state-funded secondary schools in the capital that want them. But just 15% of schools that received letters from the Deputy Mayor for Policing and Crime, Sophie Linden, have taken up the offer since October 2017. Conservative opponent Shaun Bailey said the mayor's response was "inadequate". Mr Khan said the Met was working to bring justice for the families of the boy and three young men who were killed. But he added: "This is a problem that cannot be solved by the police alone. "Schools have a vital part to play in our fight against knife crime by creating a safe, positive place for students, spotting danger signs and spreading the message that carrying a knife is more likely to ruin your life than save it." The metal-detecting wands, which cost £66.72 each, are a part of the mayor's Knife Crime Strategy, launched in June. It has provided an extra £625,000 for knife and gang crime projects, taking the total spending this financial year to £7m. But Conservative London Assembly member Shaun Bailey said the mayor's "inadequate" offer of knife wands showed a "complete lack of understanding of the issues". He added: "These men were not in school when they were stabbed to death. People are dying on our streets and nothing is being done. "Our city needs practical solutions, not small pots of money for meaningless projects." There are 503,704 pupils in London's 498 state-funded secondary schools, according to the Department for Education. Of these schools, 76 have requested and received a knife wand so far. Since the four deaths at the weekend another young man was chased by a group of men and stabbed more than 10 times in Harrow, north-west London. No arrests have yet been made and the 20-year-old victim's injuries were not life-threatening, police said.